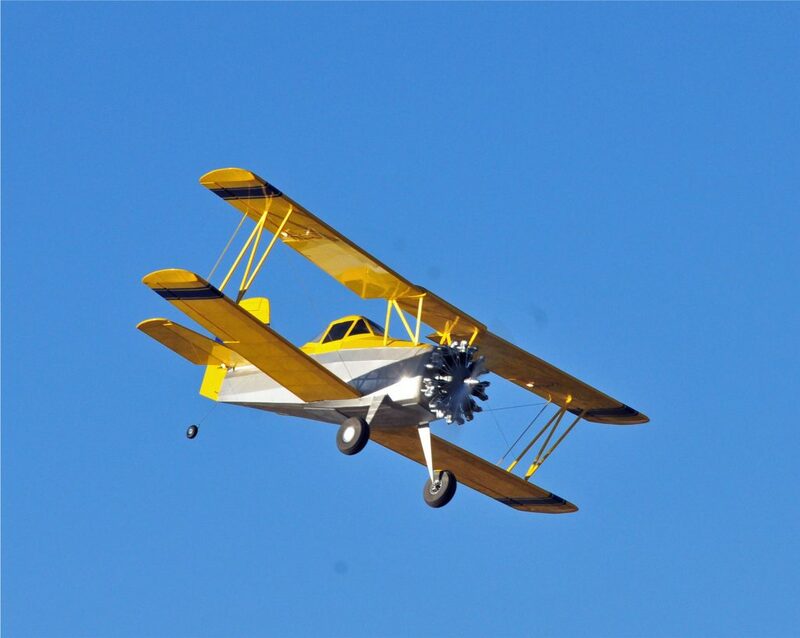 Designed in 1955, the Grumman Ag Cat was the first purpose built Agriculture plane offered by a major aircraft manufacturer. 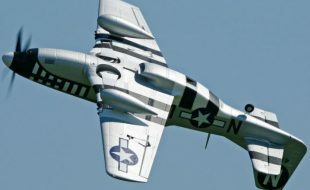 The first G-164 Ag Cat flew on May 27, 1957. 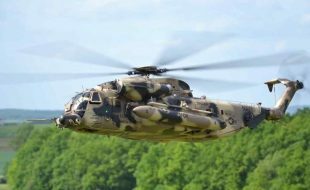 Over the years, the rights to production have been changed hands several times with the production of Ag Cat’s totaling 2,455 airplanes from 1959 to 1995. 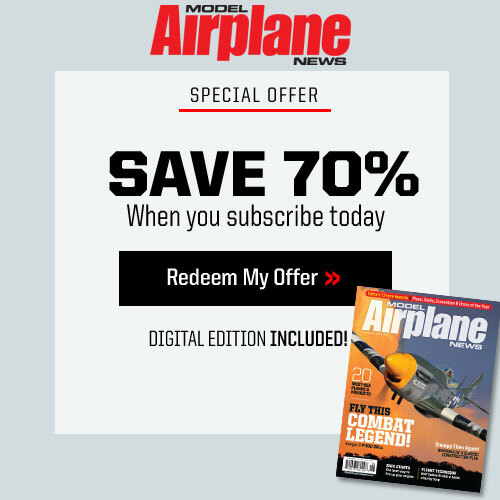 During that time the airplane was fitted with several piston engine types, and ultimately upgraded to the PT-6A, 750 horse power Turbo Prop configuration. The turbo powered Ag Cat has a 42’ 4 1/4” wingspan, is 27’ 7 1/4” long and a gross flying weight of 2,020 lb. The Ag Cat has a maximum speed of 157 MPH, cruises at 130 MPH, and a stall speed of 64 MPH. 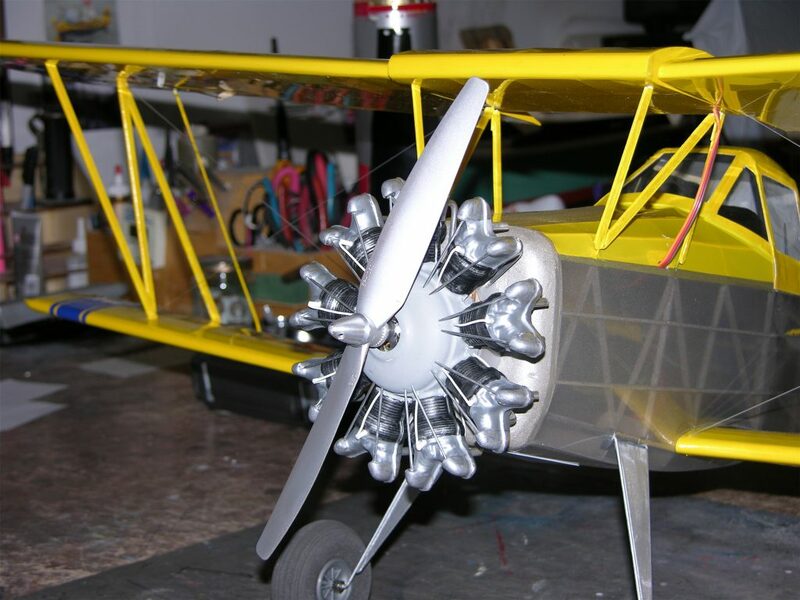 Designed by Pat Tritle, the Model is 1/12 scale, and is of the earlier version powered by the Pratt and Whitney R-1340 radial engine. 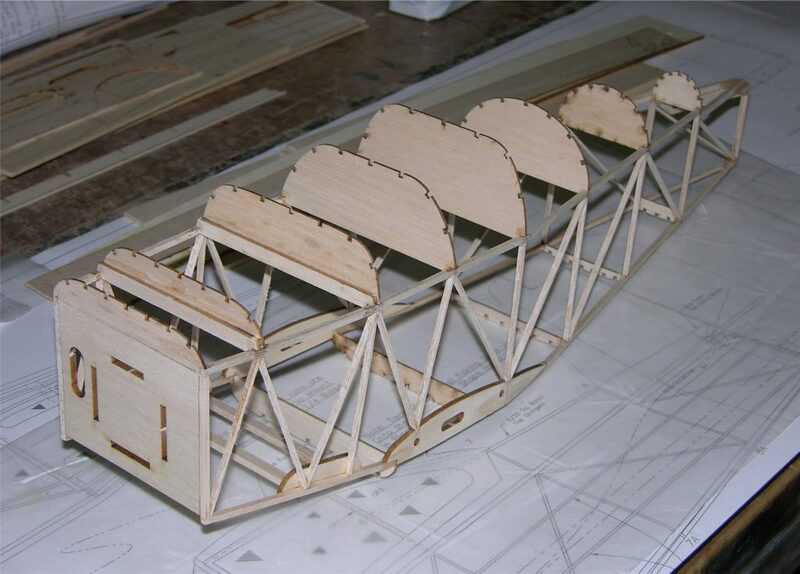 The idea behind the design was to produce a light weight Park Flyer type scale model that can be flown in smaller venues with scale-like performance. Power is provided by a Suppo 2212 or E-Flite Park 400 Outrunner motor, with 4 ch. 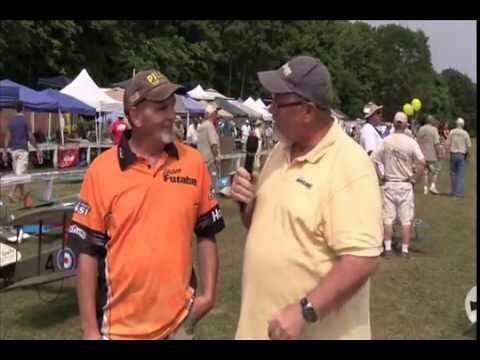 R/C control. 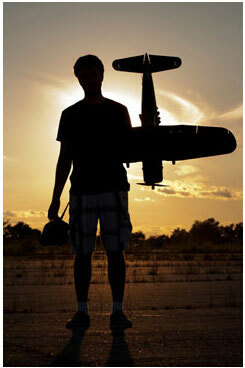 For those who like a little more power, the Suppo 2217 (950 KV) or E-Flite 450 and a 2S 1800 – 2100 mah battery. Construction is primarily of Balsa and Lite Ply. 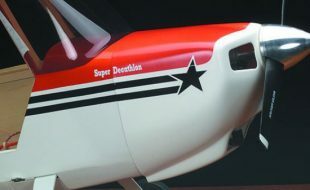 The fuselage and tail section are of the typical “stick frame” style to keep them light and strong. 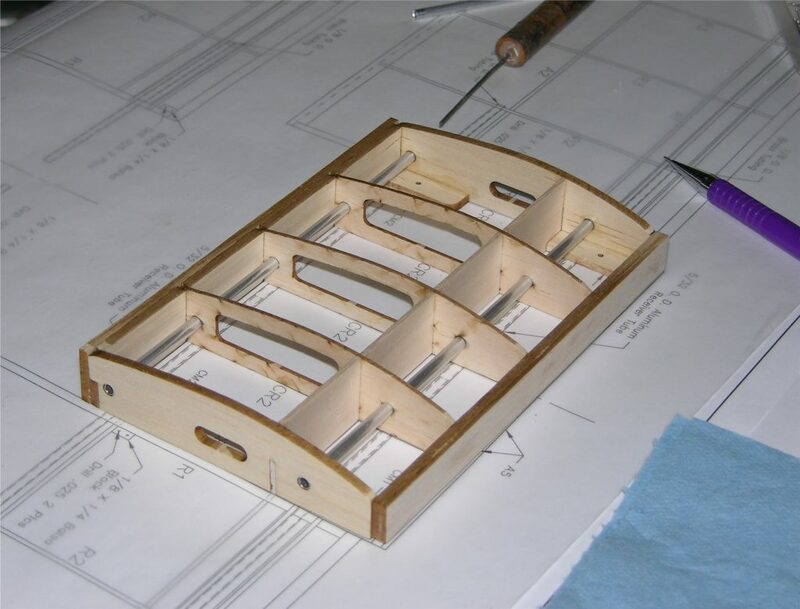 The wings are of the “egg crate” style to keep assembly quick and simple. 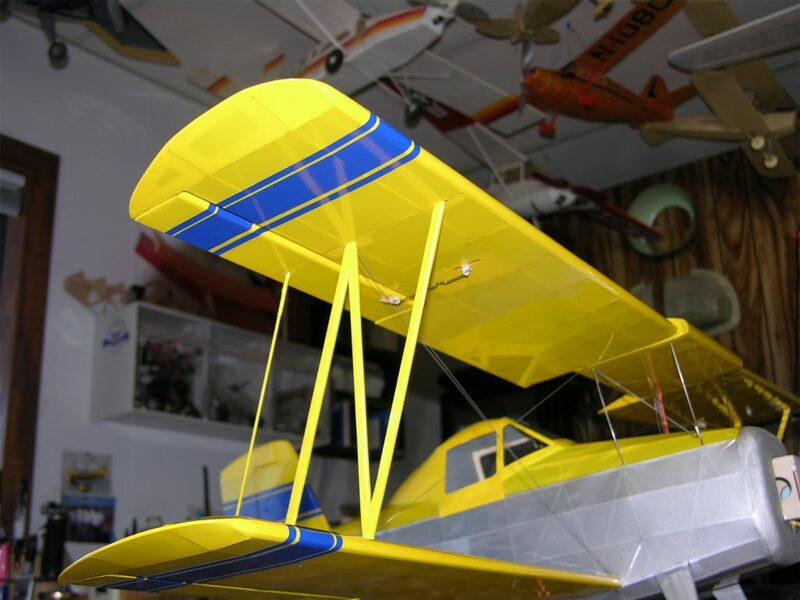 As compact as the model is, it should never need to come apart under normal circumstances, but to aid in ease of transport and field assembly when necessary; the wings are removable in pairs by plugging them into the fuselage and top wing center section and are retained with a small piece of clear tape. 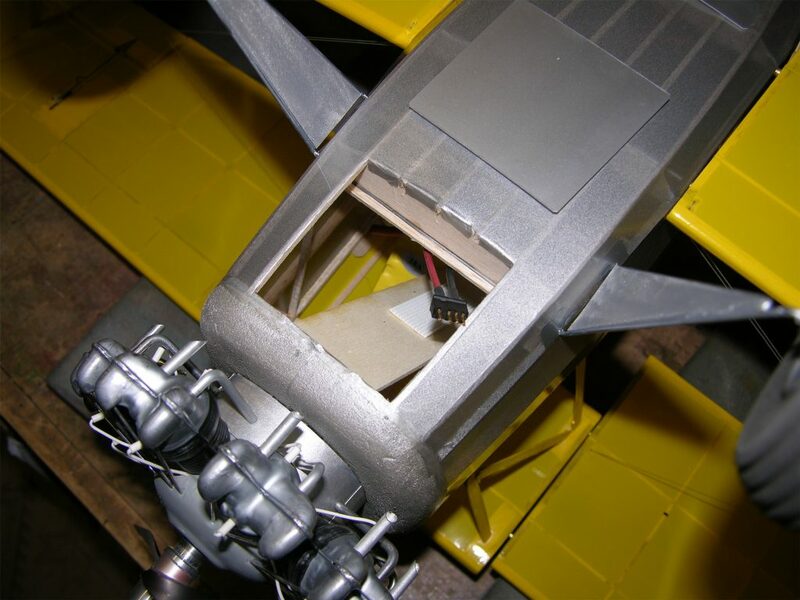 The fuselage servos and battery are accessed through hatches on the fuselage bottom. 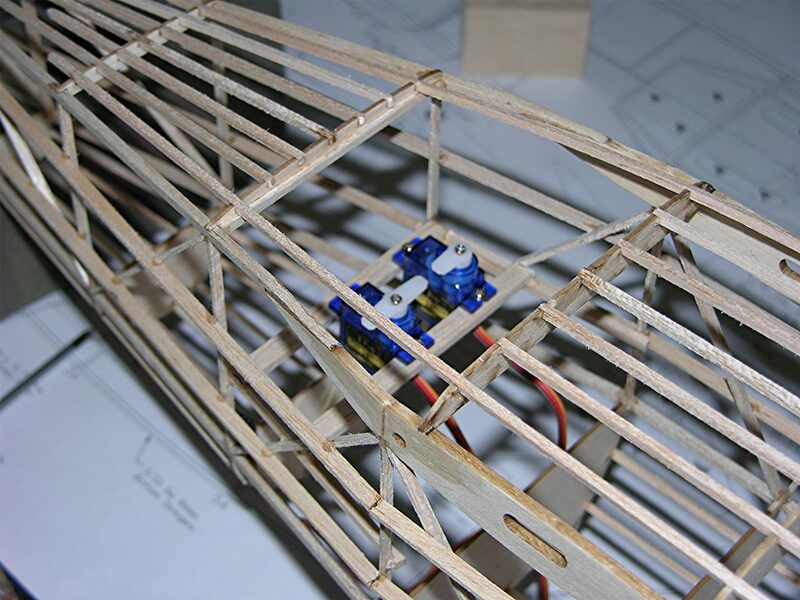 The aileron servos are built into the wings with the upper and lower ailerons connected with a link rod. Begin by cutting out all the parts using the provided Pattern Sheets. For those who prefer Laser Cut parts, a Wood and Plastic Pack are available from www.patscustom-models.com. 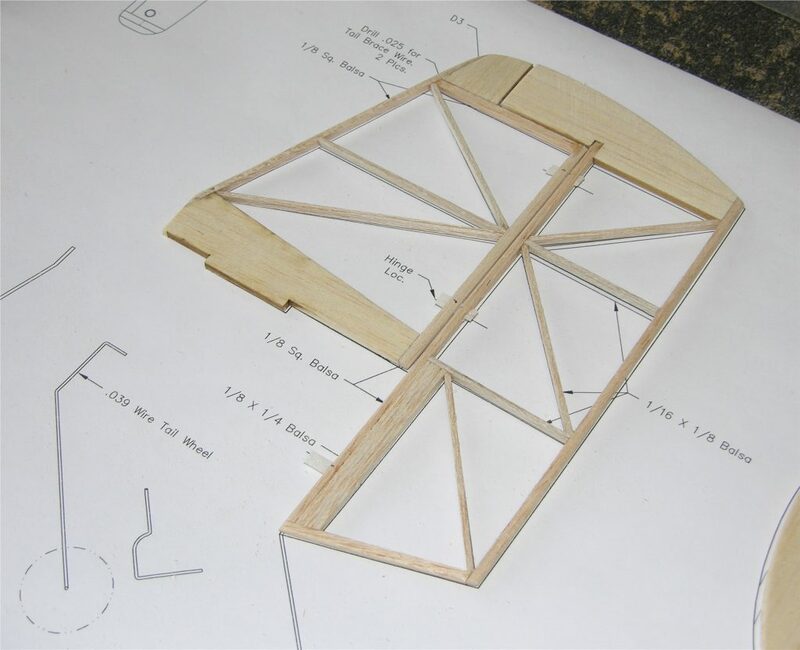 Tail Section Assembly: Frame the Vertical and Horizontal Stabilizers directly over the plans using the wood sizes shown. With framing completed, lift the assemblies from the board and sand to shape. Cut in the hinges, but don’t glue them in until after the frames are covered. 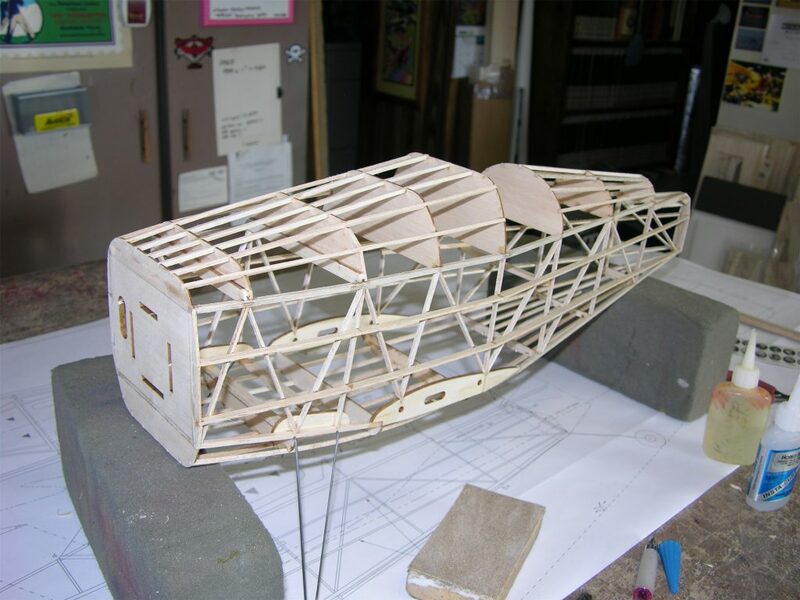 Wing Assembly: The Wings are built directly over the plans. Starting with the Top Wing Center Section, pin CM1 & CM2 in place on the plan, followed by the Main Spar, Ribs and Trailing Edge parts. Fit and glue the Leading Edge in place to complete the basic assembly. Lift the assembly from the board and sand to shape. And finally, fit and glue the 5/32 O. D. Aluminum Receiver Tubes in place. 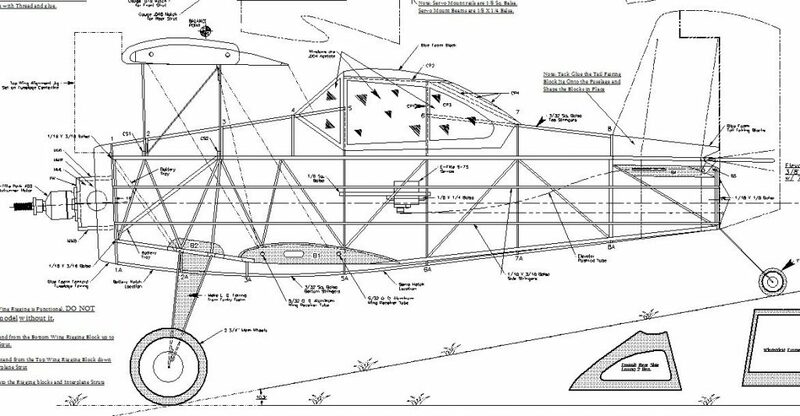 The Top Wing construction begins by pinning A7 & A8 in place on the plans. Dry fit the Ribs/Spar assembly together, then pin it over the plans and glue each point of contact. 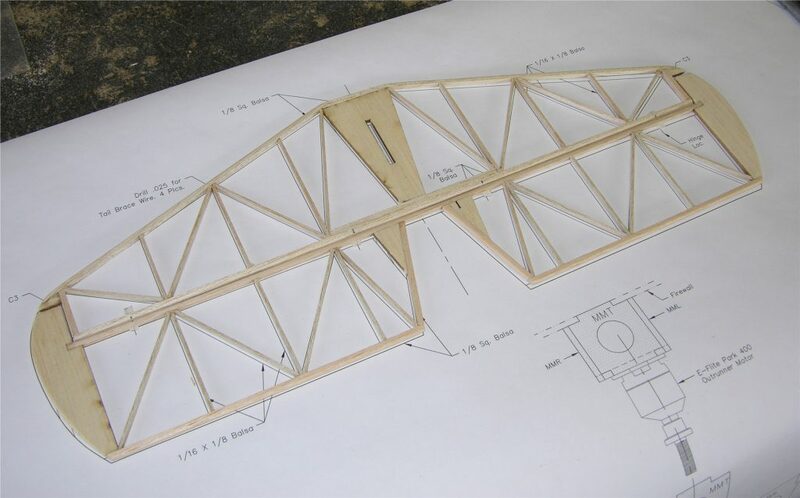 Align and glue the Leading and Trailing Edges, Wing tip Plates and 1/16 X 1/8 Balsa span wise Top Stringers in place. The Ailerons are built directly into the Wing Assembly. Start by sanding the bevel into A6 using the Rib Detail Drawing as reference. 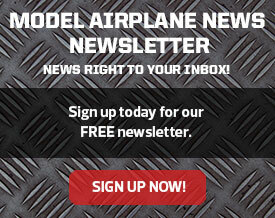 Build up the aileron, and when complete, remove the wing Assembly from the board and sand to basic shape. 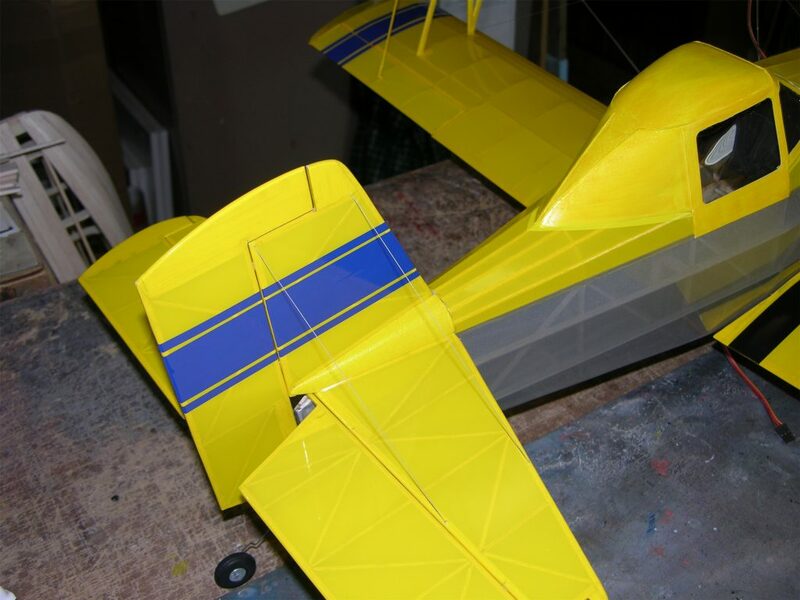 Remove the Aileron from the panel and sand to final shape. Cut in the hinges, but don’t glue them in until after the frames are covered. 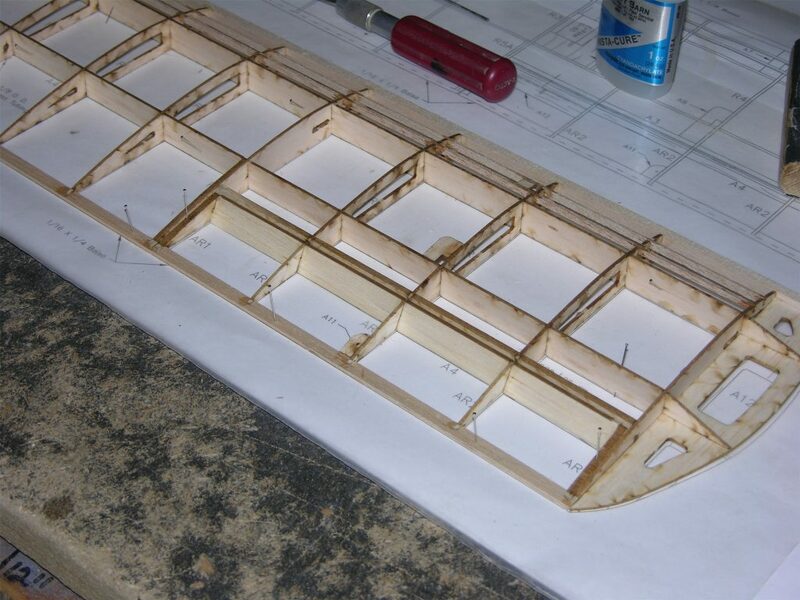 And finally, Fit and glue the 1/8 O. D. Brass Joiner Tubes into the wings to complete the Wing Assembly. The Bottom Wing Panels are built the same as the Top, beginning with pinning SM2 over the plans. Frame the panels as the Top Wing was built, and then add the A9 & A10 Strut Mounts flush with the top surface of the Wing. The Root Fairing is built up from RFT & RFB using the R1 Rib Detail Drawing as reference. When the Panels are completed, sand to shape, cut in the Hinges and add the Brass Joiner Tubes to complete the assembly. 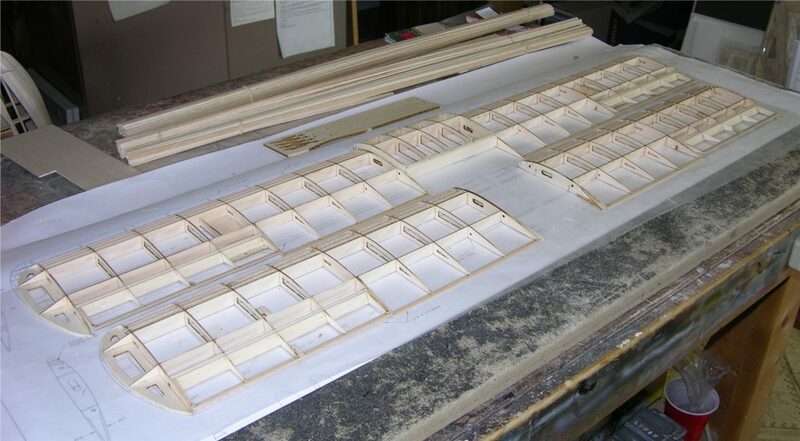 Fuselage Assembly: Build both Fuselage Side Frames directly over the Plan using the part numbers and wood sizes shown. Note that B4 is located on the R. H. Side Frame, glued flush with the outside edge of the frame. Before lifting the Frame from the board, mark the location of formers 3A & 5A on B1. With the Side Frames completed, align and glue B2 in place on each frame — be sure the elevator Pushrod exits on the R. H. side. Then, carefully crack the Frames at the locations shown and gently bend the angles in as shown on the Top/Bottom Framing Plan. Join the Frames by pinning them in place over the Framing Plan right side up. Align and glue Formers 3, 4, & 5 in place on the frame. Pull the aft end of the Frame together, align and glue the tail post. 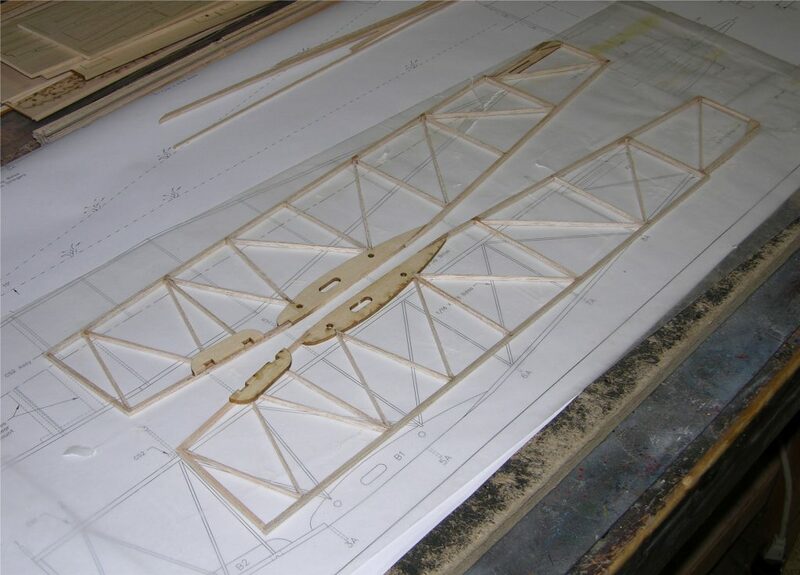 Remove the Frame from the board, align and glue 3A & 5A in place at the marks made earlier followed by each of the upper and lower Formers on the aft fuselage section. Align and glue Formers 1 & 1A in place. Build up Former assemblies 2 & 3 using CS1/CS1A and CS2/CS2A and glue in place. Make up the Landing Gear Mount Beams from 1/8 X 1/4 firm Balsa and glue in place. Former 2A won’t be glued in until after the Landing Gear is in place. Bend the Landing Gear components using the provided patterns. Tape the struts in place on the mount beams, and then wrap the joints with fine copper wire and solder. Lash the Landing Gear assembly to the mount beams with thread and secure with a drop of thin Cya. Now Former 2A is glued in place followed by all of the Fuselage Stringers. Cut the Stringers at the Hatch Locations, and then build up the Battery and Servo Hatch Covers from .010-inch Styrene using the Detail Drawings provided. 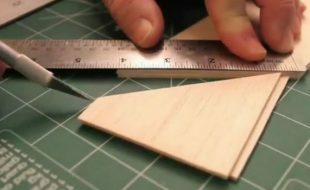 Build the Tail Block Fairing Jig and tack glue to the Fuselage and carve the Fairing Blocks from Blue Foam or soft Balsa blocks. 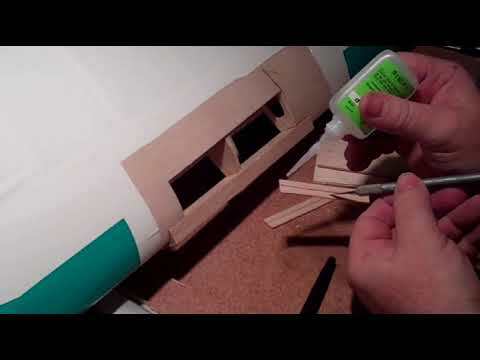 Build up the Canopy Assembly and test fit it to the Fuselage, but don’t glue it in place until after the model is covered. Set up the Servo Rails as shown on the plans, mount the Servos and run in the Elevator Pushrod and Rudder Pull/Pull cables. 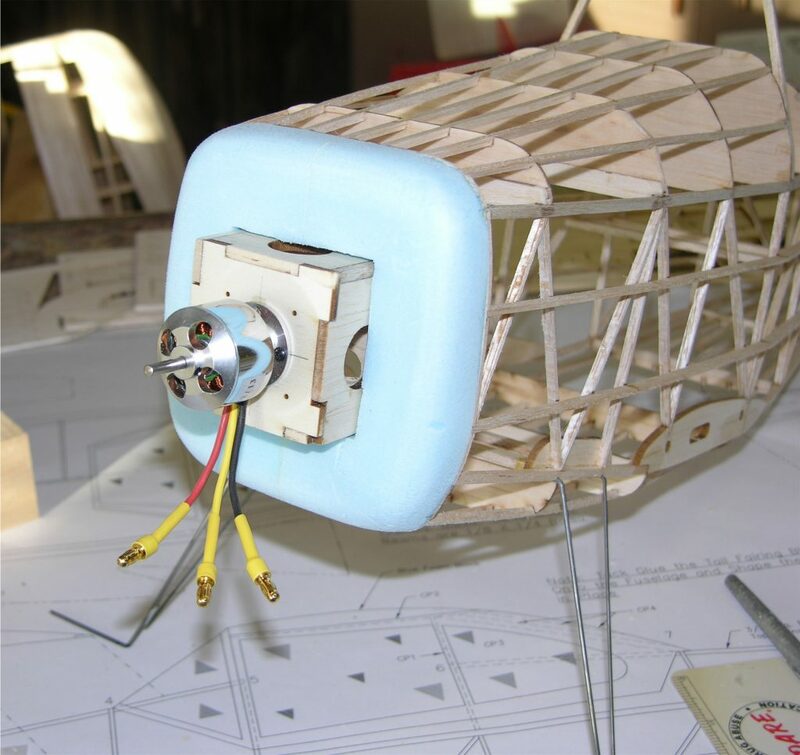 Tape the Rudder in place on the Fuselage, tie off the cables, and then mark the exact location on the plans where the cables exit the fuselage – this information will come in very handy after the model is covered. 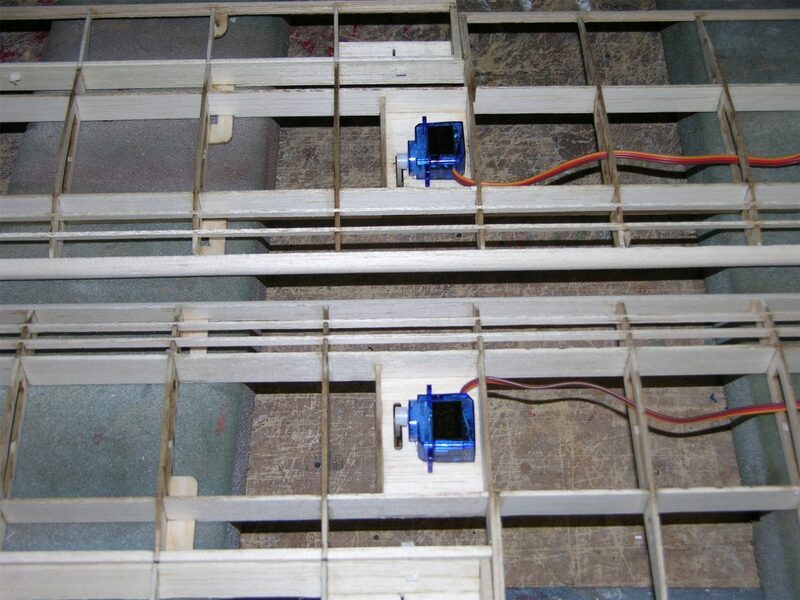 Mount the Servos in the Wings using Silicone Caulk and set aside until dry, and then run in the Extension Leads. Build up the Motor Mount and glue it in place on the Firewall. 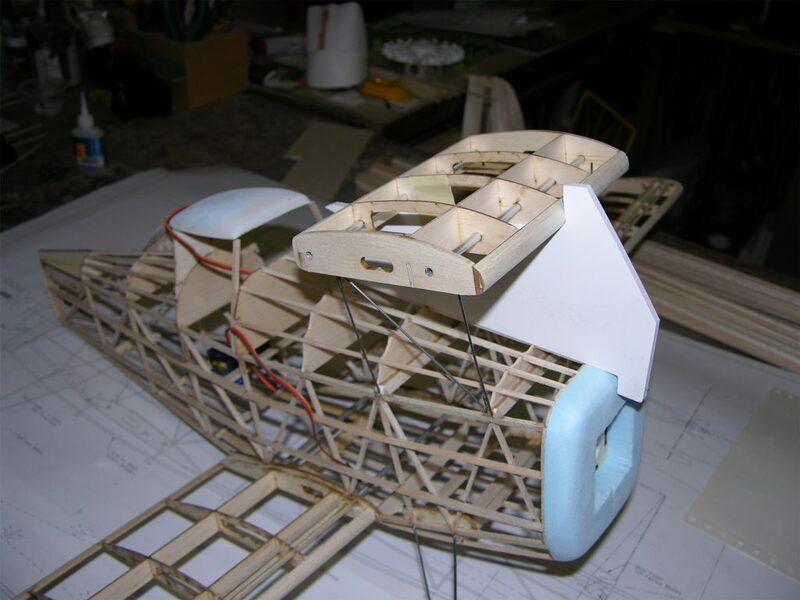 Cut the Forward Fuselage Fairing block from blue foam or soft balsa, glue it in place and sand to shape. Mount the motor and ESC and test run the motor to insure proper direction of rotation. 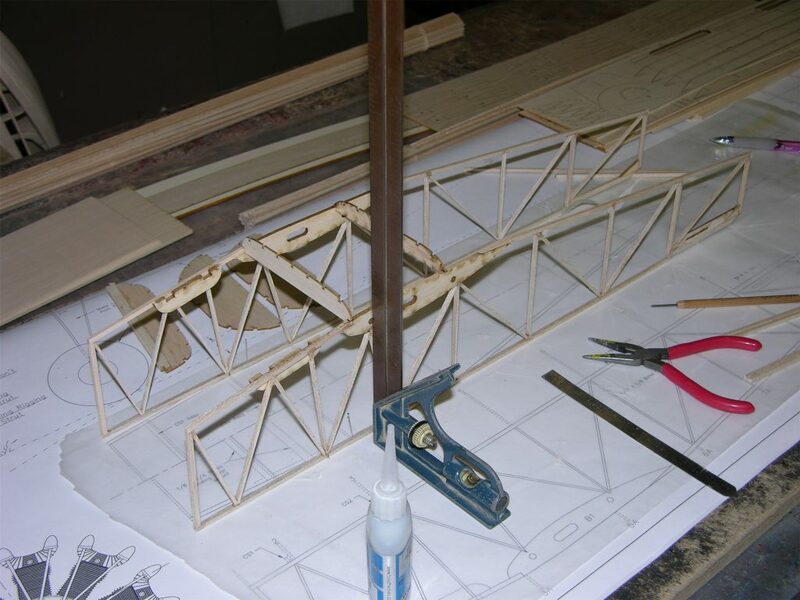 Fitting the Wings: The Cabane and Interplane Strut assemblies are built up directly over the plans using the provided detail drawings. Pin the Alignment Jig onto the fuselage center line, fit the Cabanes into the Fuselage and slip the Center Section over the struts. Plug the wings into the Fuselage and Top Wing Center Section followed by the Interplane Struts. Everything should be lined up pretty well, but if a bit of adjustment is needed, make it now while it’s still easy. Once the wings are properly aligned, disassemble the model and do a good detail sanding and the model will be ready to cover. 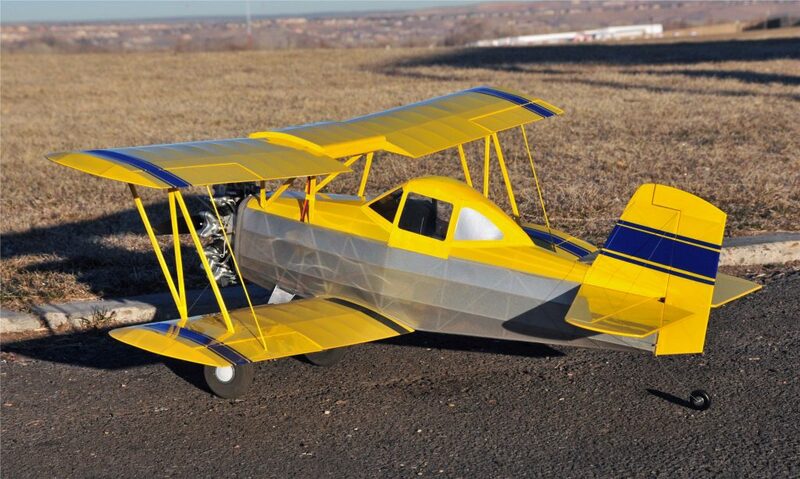 Covering the Ag Cat: The model is covered with Microlite, but for the purist, this would be a terrific candidate for light Silk Span and dope. Either way, cover all the frames — except the top of the Top Wing Center Section — and add the desired trim. Custom Trim can be ordered from Callie Graphics at www.callie-graphics.com, or make up your own using you favorite method. Then once the cover is in place, build up the Vac-Formed radial engine and detail as desired. I added the intake manifolds and push rods using aluminum wire, and exhaust stacks from aluminum tube. The spark plugs are bits of plastic tubing with the secondary leads made from soft electrical wire. You’re probably going to need a bit of nose weight anyway, so you might as well add it with detail, right? Final Assembly: Begin by pinning the Wing Alignment Jig back on the fuselage. Slip the wings in place followed by the Interplane Struts, and once everything is square and true, secure the C-Section at the cabanes with a drop of thin Cya. Then add a drop of 5 minute epoxy at each point of contact. Now, remove the wings and cover the top of the C-Section. Make up the Hinges from thin Cya Hinge Stock and glue in place using Canopy Glue. 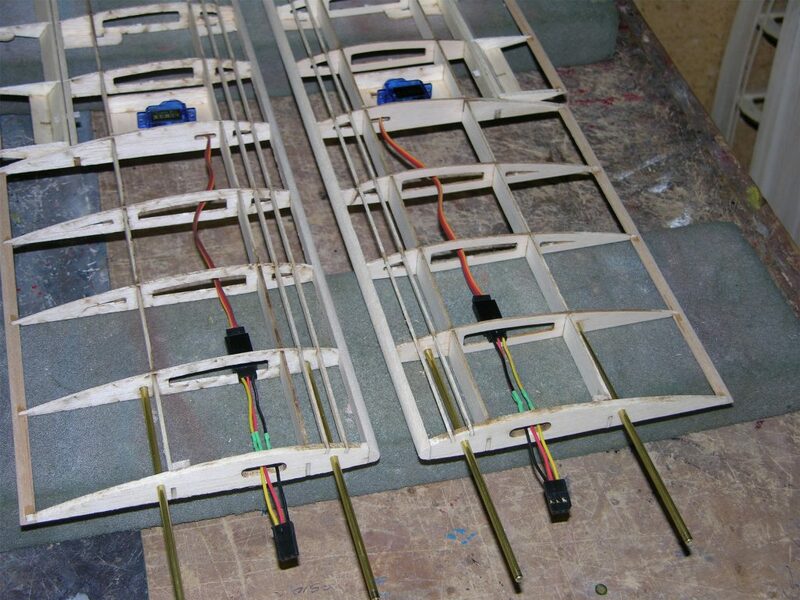 Center the Servos and make up the aileron push rods from .032-inch steel wire with a Z-Bend at both ends. 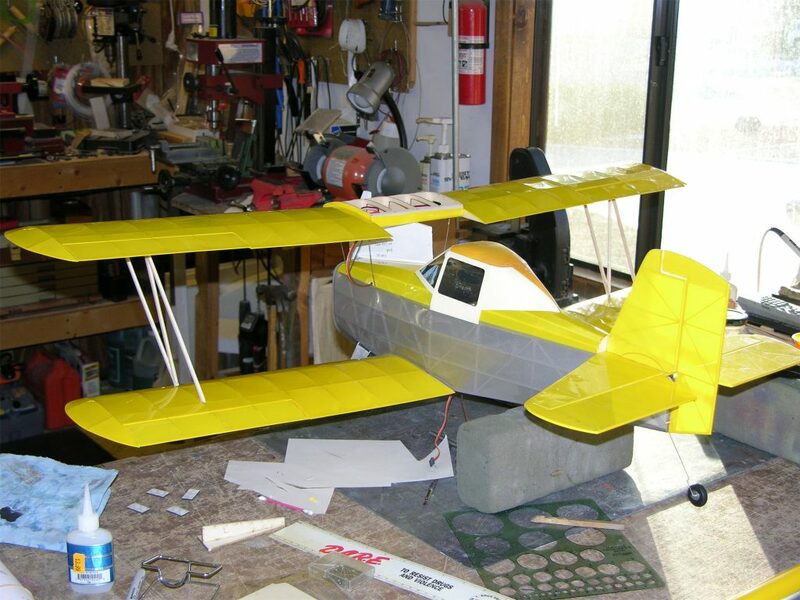 Align the ailerons and glue the Control Horn in place followed by the upper and lower Link Rod Horns. Fit the Wings back onto the Fuselage, align and glue the Interplane Struts in place followed by the Vertical and Horizontal Stabilizers. Set up the Rudder and Elevator control systems. 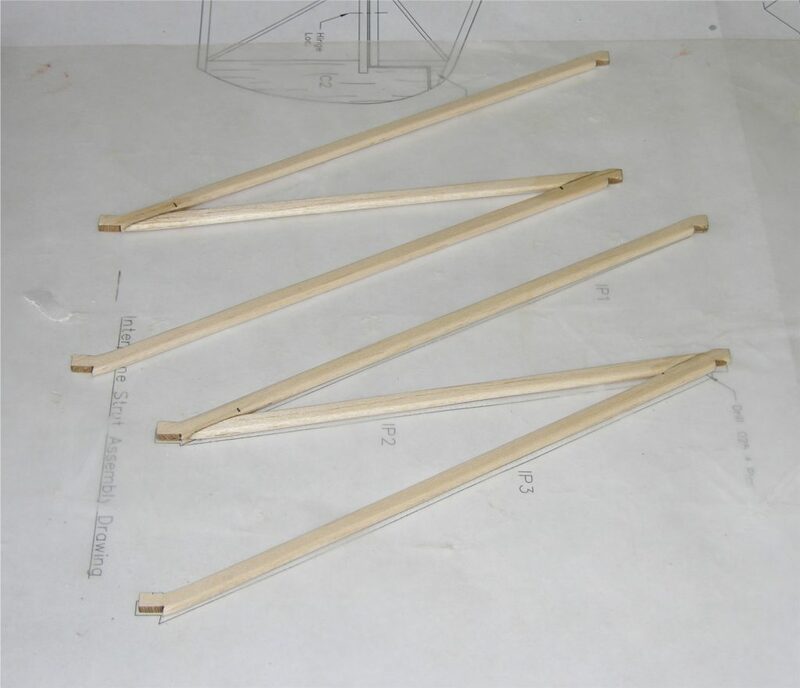 The Aileron Link Rods are built up from steel wire and aluminum tubing, aligned on the model, and secured with a drop of thin Cya top and bottom. Now you can connect the Rx and set up the control throws as shown on the plans. 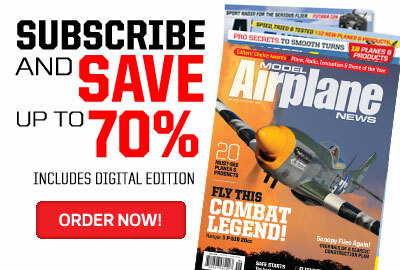 Adding the Flying and Landing Wires: DON’T skip this step! 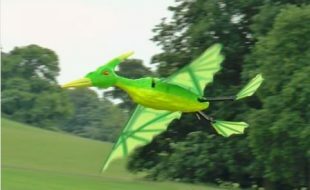 The model is not designed to be self supporting, and flying it without the rigging will likely as not end in disaster. The rigging is made up from nylon carpet thread, and is run in per the instruction on the plans next to the Fuselage Side View on Sheet 1 of the plans. 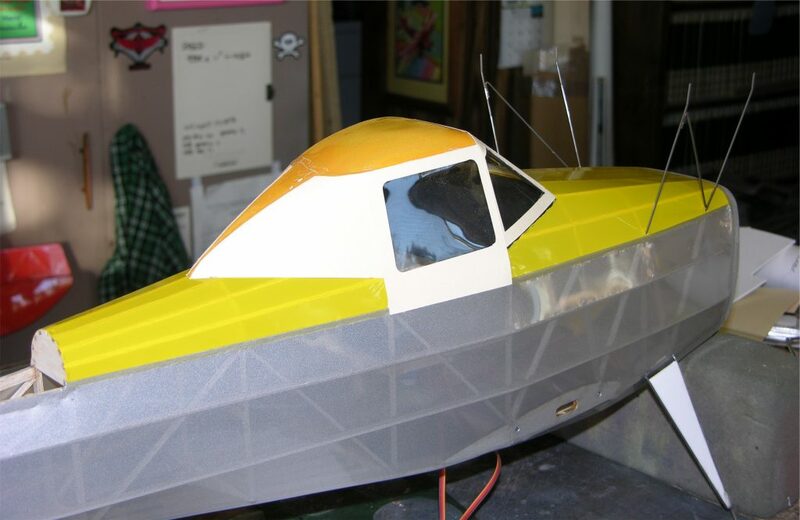 To finish things up, glue the Canopy Assembly in place followed by the windows and paper fairings. 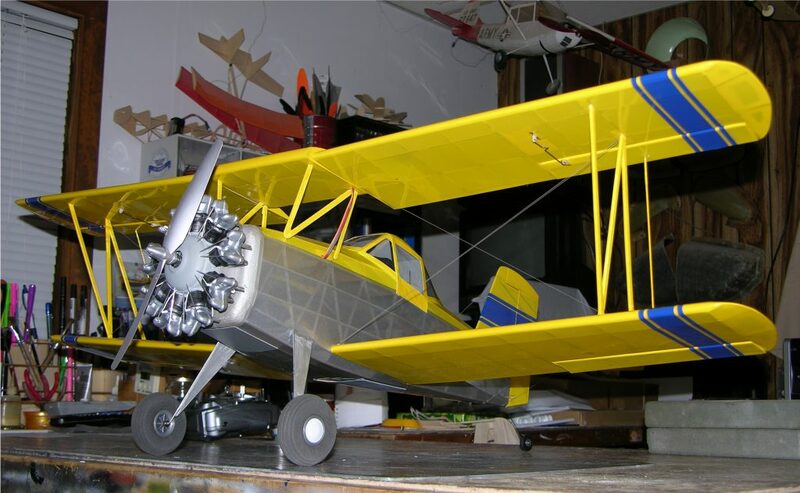 Mount the wheels, and dummy radial engine and add any desired details to complete the model. The battery tray is made up from Lite Ply and glued in place between the Firewall and front Landing Gear Mount Beam. Secure the battery to the Tray with Velcro. Balance the model at the point shown on the plans, and if a bit more nose weight is needed, go with either a larger battery, more dummy engine detail, or a bit of ballast. And at this point, the Ag Cat is finished and ready to fly. 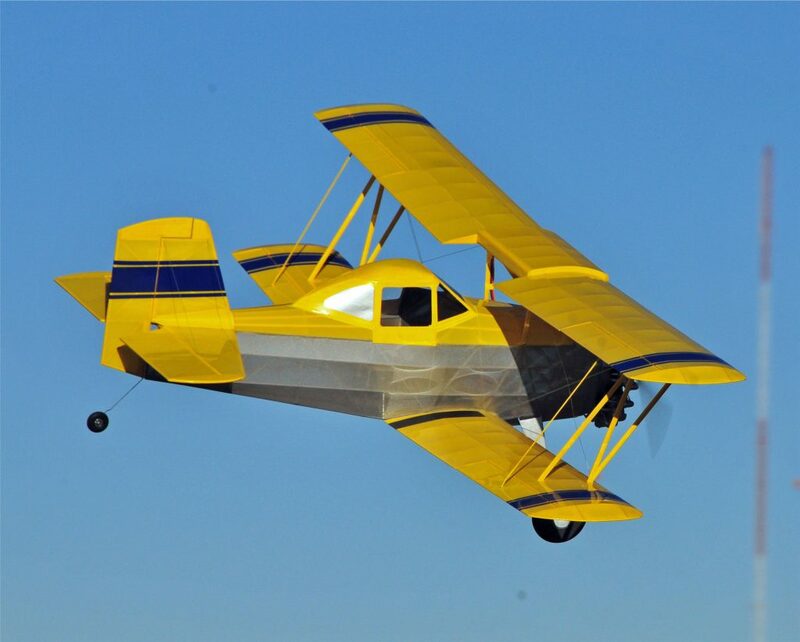 Flying the Ag Cat: In spite of its short couple, stubby, and gangly look, the Ag Cat is very easy to fly and is extremely stable. Its only downside is that the Elevator can be a bit sensitive to input, so with the controls set up as shown, start out with the dual rate on for the initial test flights. 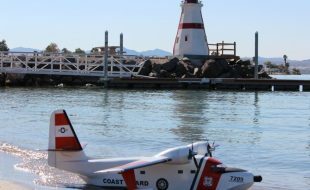 Ground handling is no problem, and once in the air the ailerons exhibit very little adverse yaw, and though a little rudder input is never a bad thing, it’s really not necessary. And wait till you see how steady she is in those low “Duster Passes”. 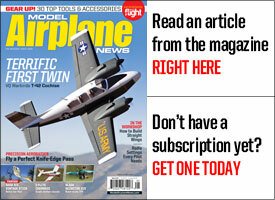 I was surprised at how well the model penetrates in the glide too, but for a standard approach, landings require a little power on the glide slope, but once in ground effect the model will float a little right before touchdown, so don’t be surprised if the first couple landings go a little long. And that’s all there is to it. 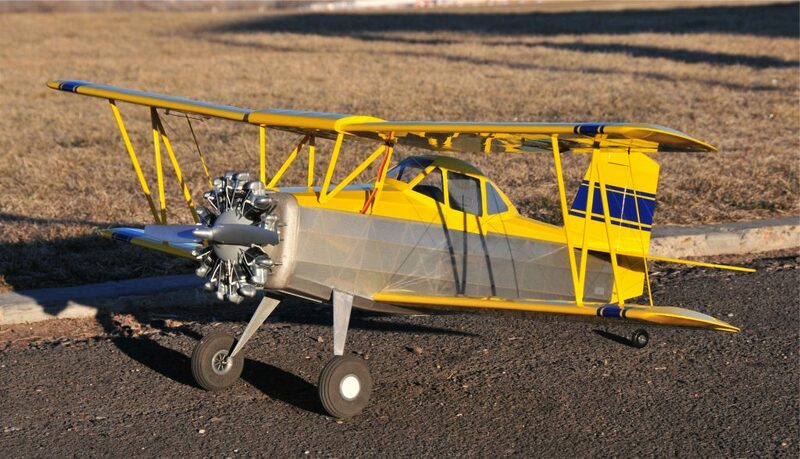 The Ag Cat is a great build and a terrific flyer, so don’t let the odd proportions scare you. It really is a gentle and forgiving platform, and in spite of its relatively small size and light weight it’ll handle those light breezes well too. To order plans Click Here.